Welcome to Tiare, a luxurious yet traditional Indonesian Phinisi that will take you on a journey of discovery to some of the most stunning diving spots in the world. 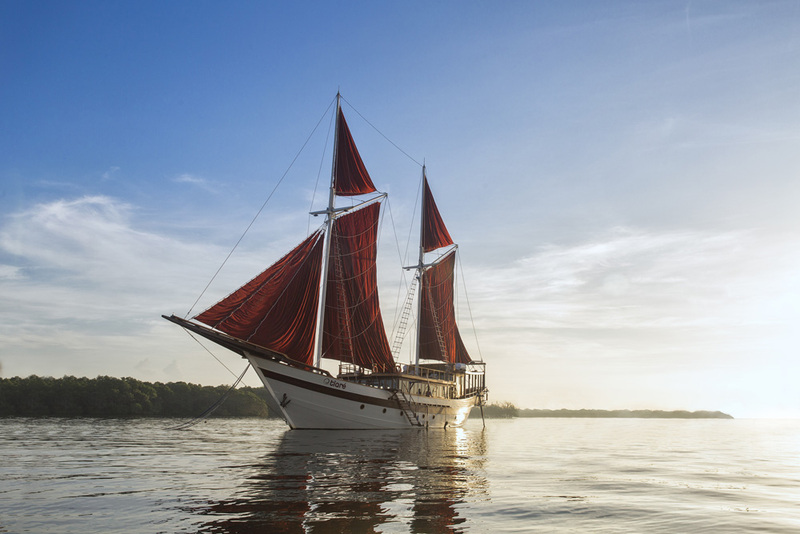 Tiare offers a spectacular experience for divers as well as non-divers, with bright airy cabins, spacious bathrooms and a large front deck where you can socialize, eat under the stars or just relax in the Indonesian sunshine. There is also a separate diving deck with hot water showers to warm up after a night dive. All indoor and outdoor living areas, decks, and cabins are made with antique teak salvaged from old Joglos, which not only gives the feel of “real Indonesia”, but has helped to reduce the use of Indonesia’s disappearing rain forests More like a 5-star hotel than a boat, the six cabins on Tiaré are your home away from home designed with relaxation and the perfect sleep in mind. You’ll enjoy soft linens and well thought out lighting and plug placement as well as spacious en-suite bathrooms, hot water showers and environmental friendly body wash and shampoo. Two triple cabins are spacious enough to accommodate two adults and one child or three adults, with under-bed storage to ensure ease of movement around the cabin. The other four cabins, two twin and two double, accommodate two adults each for a maximum capacity of 14 guests. With 14 guests on board Tiaré is comfortable and spacious enough for both a social atmosphere and space to relax and enjoy down time in the luxurious cabins. All indoor spaces on board Tiare are equipped with air conditioner to ensure your comfort. WiFi is accessible in the whole area of the boat except in some remote areas. Sound system is also provided public areas both indoor and outdoor should you want to enjoy some music. However, this is not available inside the cabins. Fire detecting system, is also in place to ensure your safety during cruise. A glass of white or red wine during happy hours or before dining. Diving equipment in case guest’s personal equipment fail.